Veterinary Techniques for Llamas and Alpacas provides a step-by-step guide to performing procedures in llamas and alpacas. Organized by body system, the book presents concise, visually oriented information to enable clinicians to treat these animals with confidence. With coverage ranging from basic maintenance such as restraint and catheterization to more complex procedures such as minimally invasive surgery, Veterinary Techniques for Llamas and Alpacas describes the full range of techniques required for the medical management of these species. Each procedure is described in detail, with a consistent format for ease of use and accompanying photographs to illustrate the concepts described. A companion website offers videos of many of the procedures discussed in the book. 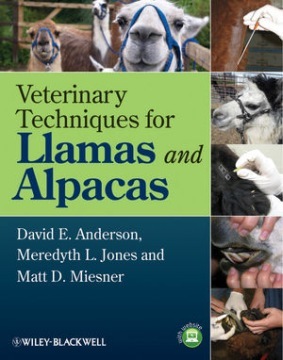 Veterinary Techniques for Llamas and Alpacas is an essential resource for any veterinarian or technical staff member treating South American camelid patients.